Hello dear ones! This was our first year celebrating Epiphany. I have a knack for picking up holidays. My mom says that every day is a holiday for me. Our Epiphany journey started with learning that the 12 days of Christmas song has a deeper Christian meaning. I was intrigued. 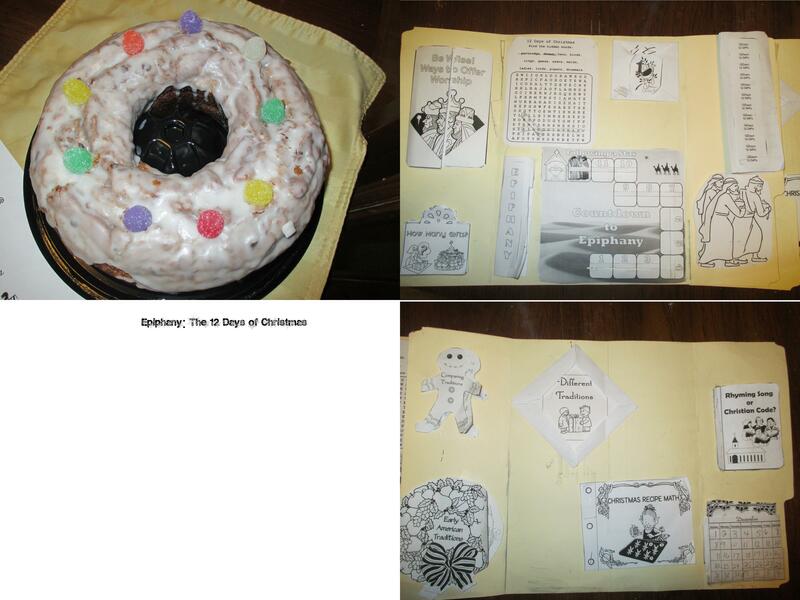 So I put together a 12 days of Christmas lapbook from In the Hands of a Child. Each day we learned about the Christian and secular meaning of the song. Then on Epiphany itself (yesterday) we had a King cake. I just bought a cake from the bakery and added gumdrops to the top. Below the picture I’ll list the Christian meaning of the 12 days of Christmas. I also have a link with craft ideas. We did not do any crafts but maybe next time. Michael has however been writing the Apostle’s Creed in cursive. The gift giver is our Heavenly Father. PS: The word “catholic” in the Apostle’s creed is not referring to the Catholic religion but actually means “universal”. Spurgeon.org has a good article explaining the purpose of the creed. Previous Previous post: New Year’s Eve Party!